WTI crude prices are down in the range of $45.40/b-$45.80/b this morning. WTI prices stagnated yesterday and closed at $45.64/b. WTI opened at $45.71/b today, a decline of $0.14, or 0.31%, below yesterday’s opening price. 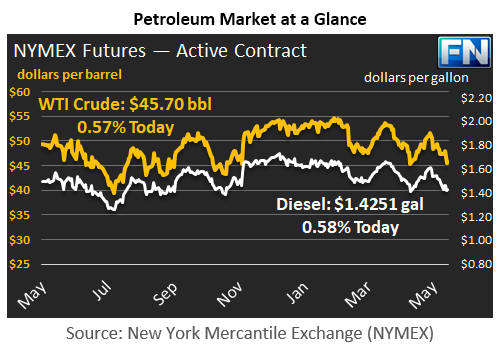 Current prices are $45.70/b, up by $0.06 from yesterday’s closing price. Diesel opened at $1.4225/gallon this morning. This was a decline of 0.43 cents (0.3%) below yesterday’s opening price. Current prices are $1.4251/gallon, up by 0.28 cents from yesterday’s closing price. Gasoline opened at $1.4919/gallon today, a decline of 1.04 cents, or 0.69%, from yesterday’s opening. Prices are $1.4942/gallon currently, up by 0.23 cents from yesterday’s close. 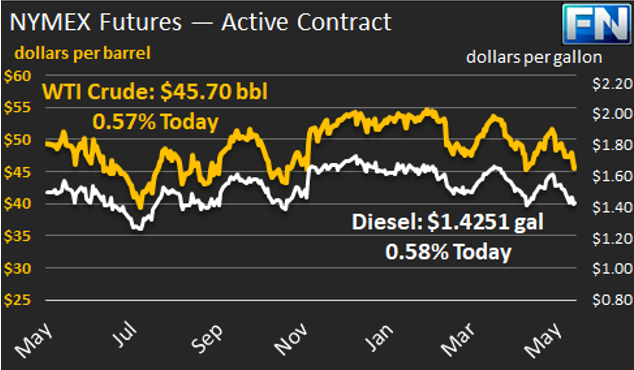 Today’s prices have been fairly stable in the $45.25-$45.75/b range, and the $45/b floor has been holding. Thus far, it appears that most of the downward price movement occurred after Wednesday’s release of the weekly supply data from the Energy Information Administration (EIA). Although a weekly set of data does not determine a long-term trend, the data was bearish, and the market responded. The EIA reported a crude stock build of nearly 3.3 mmbbls, a gasoline stock build of 3.324 mmbbls, and a diesel stock build of 4.355 mmbbls. The EIA data also showed a huge drop in apparent demand, including a drop of 505 kbpd in gasoline demand and 520 kbpd in diesel demand.